Meeting at the Cofeca Cooperative between waste pickers and the director of enviromental development Fernando Puntigliano with its team accompanied by Jorge Fernánzez “el viejo”. From Montevideo, we’ve been moving forward to meet with the requirements imposed by the government of Montevideo, Uruguay, as a condition to sign a year’s agreement with our trade union (UCRUS, Union of Urban Waste Pickers). These requirements include the trade union to be responsible for the payment of the cooperative’s broken or stolen equipment and facilities, which we don’t agree with because of the government’s refusal to spend in security guards at night. Since UCRUS has legal status, legal means to sign agreements, they want to transfer us new responsibilities we could struggle to comply with, as our union is very poor and has no assets. In any case, we are supporting the members of the new cooperative to get a health card, which 80 members have already obtained. We also achieved that this cost would be paid by the government. Now we want to provide a single social tax, which is an individual contribution to the Social Security Bank (banco de prevision social), and to pay an accident insurance for each member. Yesterday, while the director of environmental development Fernando Puntigliano was visiting the cooperative, we told him that members cannot afford paying 1.800 pesos per month (around 60 dollars), which are the costs exposed previously. Puntigliano agreed to look for solutions on a meeting with the Ministry of Social Development (MIDES, for its Spanish acronym) and the State Insurance Bank (BSE, for its Spanish acronym) and try they pay for these costs. There is a preliminary in progress, even though the government still has not met certain things, light, water and materials to repair the changing rooms which were for years abandoned and vandalized (since the first cooperative Cofeca1 was based there with 157 self-organised members). They still have to put a perimeter fence and a security guard during the day, to record the entry of the 80 workers inscribed on the list. Fortunately, after we blocked the entry to the landfill, stopping all the city’s dump trucks and authorised carriers for businesses, myself included, as I am one of the 35 families of waste pickers reconverted with own vehicle and permit with a single social tax, we secured the transfer of waste pickers to the cooperative’s ground and the delivery of 45 trucks per day, chosen by waste pickers, which are tipped after being weighted on the weighbridge which is located at the landfill entrance. 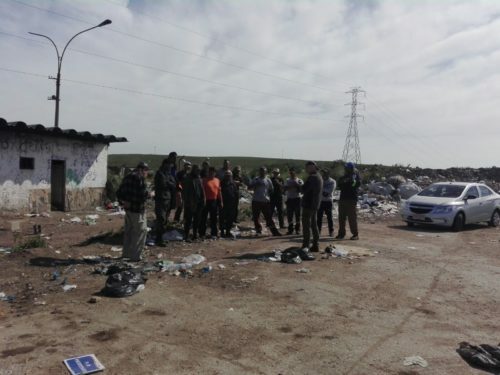 We also have a signed agreement to secure the right number of trucks and that these might be chosen by the waste pickers that was produced when we blocked the entry. So, although it is irregular due to the administration’s pressure to unblock the landfill, we are taking forward this occupational venture. We also established a set of internal rules and carry on weekly meetings with the members. We are explaining them that when the new national law on waste comes into effect (download PDF waste management draft bill, in Spanish) they will have very good chances to obtain government contracts, becoming waste managers, prior certification of competencies and quality. This is the result of the favourable conditions we set out for waste pickers during our participation in the 2016 workshops to create a new national law on waste. The National Directorate for the Environment (DINAMA, for its Spanish acronym) convened all actors and that’s where we participated as a union, to improve our selling conditions of raw materials which obviously go down in price and it takes a lot for them to bounce back. We still don’t have the ideal conditions but we are working on it.